Meet compliance standards and safeguard quality to meet regulatory requirements. For FDA regulated industries, advancing and maintaining information management systems compliant to an evolving set of FDA regulatory standards is a constant challenge. 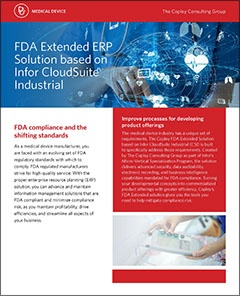 Infor CloudSuite™ Industrial for FDA Regulated industries is designed, developed and deployed to address the specific requirements of minimizing compliance risk, maintaining advanced security and electronic recording, and facilitating the validation process.